I guess you could say its the consumate classic. Black and white also feels more real somehow in photographs, though color is suppose to be that. If you look long enough at each, the black and white seems to describe an object better, and color starts looking like a distortion. Black and white has also maintained as an obsession of the fashion, home decor and tabletop world. As promised, I am sharing some of the cherished items of my grandmothers. 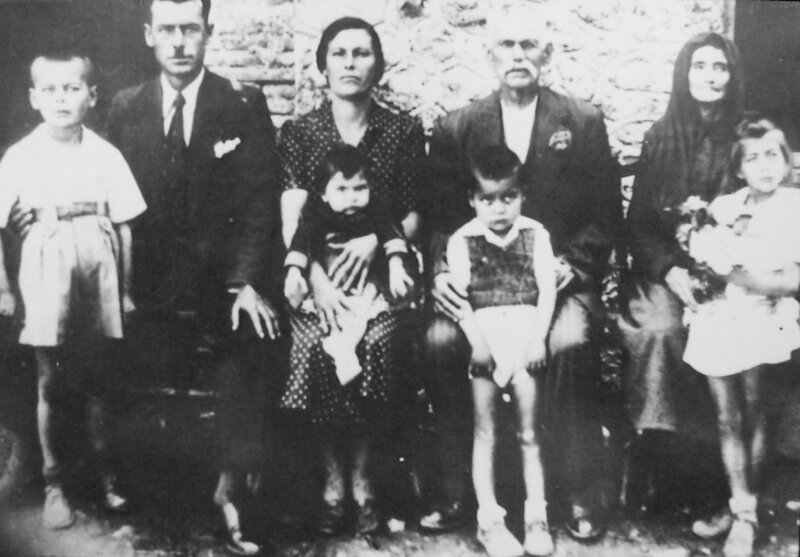 My dad's mother was my Yiayia Eleni, and I grew up a world away from her busy hands. I can count on one hand how many visits we had. A sad fact of being a first generation daughter of an immigrant. Here she is in the middle between my Papou and his parents. My dad is the pouty looking one standing in the middle. Two more children would come after this photo. She cried everytime she greeted me and said goodbye to me. She hugged really hard, and stroked my hair alot, whether I was 5 or 28. She could not read or write. She made lots and lots beautiful things. Upon most of his returns from Greece, my dad would bring back gifts from his sisters or Yiayia. 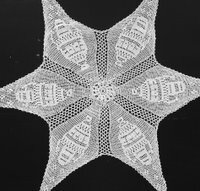 One of my favorites is this gorgeous crocheted star, about 30" in diameter. Its really beautiful on our black farm table in the dining room. 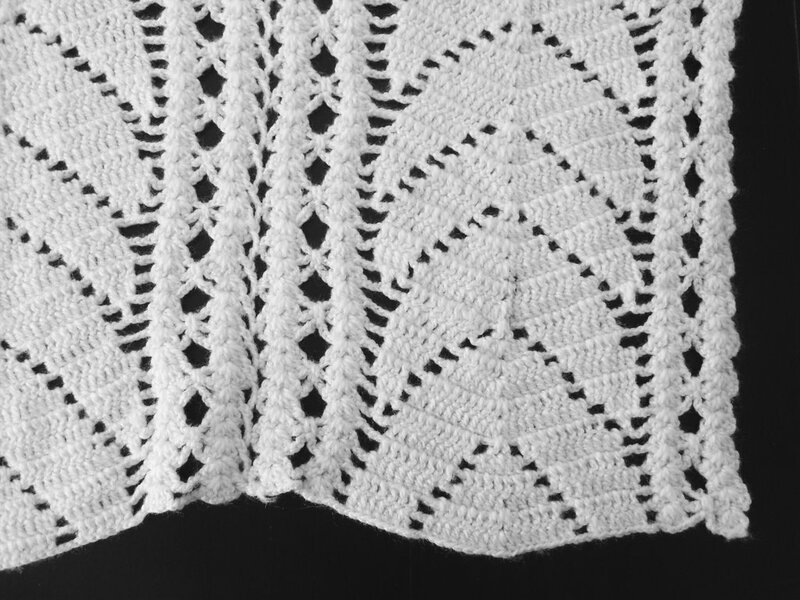 Though I've been told she used her finger to crochet without a hook, I would have to believe that a hook was used for this teeny tiny work. 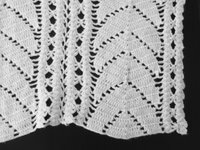 Another gorgeous don't-let-the-kids-sit-on-it item is my white wool bedspread, which I do imagine she used just her finger to crochet. She sent one each for my sister and I around the time we were both married. Word has it she could just look at stuff and figure it out, not reading or following any pattern. So across the ocean and in the farm rich lands of Indiana my mom was raised by the very beautiful and equally industrious Anna Ruth. I had the more typical grandma relationship with her, getting to visit at least once or twice a year. She made the best pies, the best cakes, the best everything. She knitted, sewed, crocheted, she did it all. And though they were not rich, the child photos of my mom and my Aunt Beth are utter glamour. Their hair and skin were soft beautiful perfection. Their matching handmade outfits and coordinating angora sweaters were of the magazine stylishness. My Grandma was a beautician for a time and really stayed such for always. Take a gander at the hipness here-this was probably taken right around 1930. I love the signature she put across it, movie-star style. She was constanly doing something, making something of nothing. One of the most basic items she made, but probably my favorite, is this cable knit sweater. She made it for my high-school age mom, so its really old (sorry mom) but I wear it all the time. 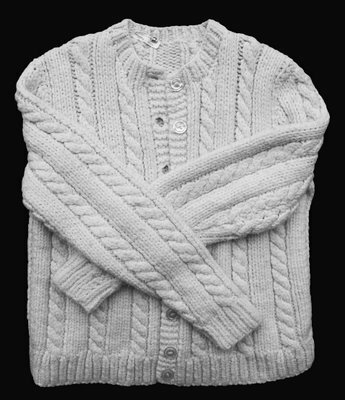 Well its clear that I have a long way to go in carrying on the tradition of knitting and crocheting. There is a very high bar there. In fact I can barely see it from where I stand with my fledgling skills. What an inspiration these women are, though. I live in such a different time, but I'm sure my desires, and fears are the same as theirs were. I'm sure my exhaustion at the end of the day pales in comparison with my Yiayia's. I'm sure my ambition at the beginning of a new day is nothing compared to my Grandmother's. 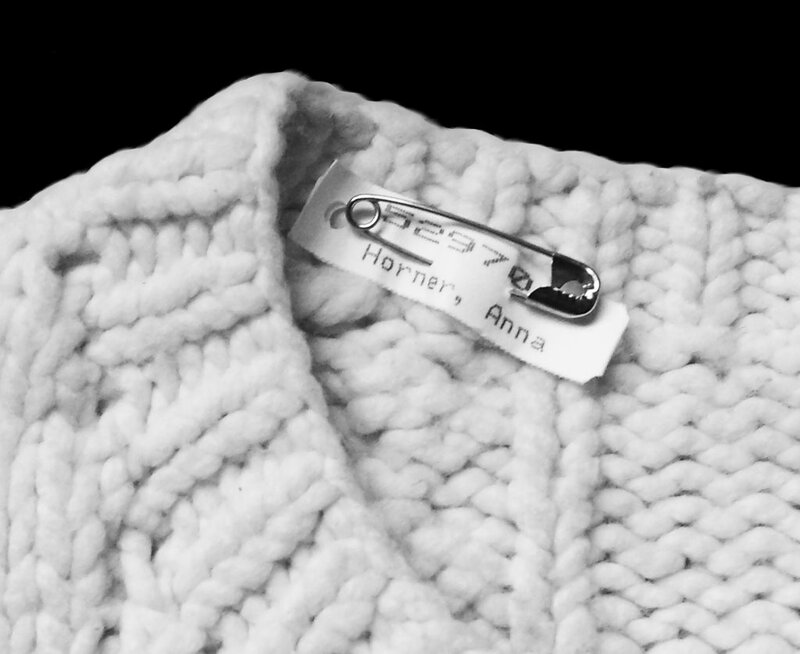 While it is such a blessing to have these wonderful items for inpsiration and warmth, its even better to have their memories, their names, and their blood running through my veins. Forgive the nostalgic indulgence today! Back to the painting side of the studio! Wow...GREAT nostalgic stuff there. Boggles my mind that she crocheted with her fingers :-O My mom nor my grandmother never could teach me because I'm left handed. What's even better than "add to bag" is that you can choose a quantity up to like 20....why not get 4 of them for good conversation!? oh my goodness, I have a yiayia eleni and I actually named my company after her! I loved your pics of the family and the kaidima (sp?) Thanks so much for sharing! Hi Helena- Isn't it a beautiful name-love your translation of it with "helena"
Its my sister's and my daughter's name too. And my sis has eleni-interiors.com as well, I'll have to send her to your cute site. Awww. I'm all teary-eyed and nostalgic thinking about your grandmas and my grandmas... Found your blog last week. Love all of your ideas and inspiration. Hmm. I'm thinking the women you shared with us are pretty pround of you too. 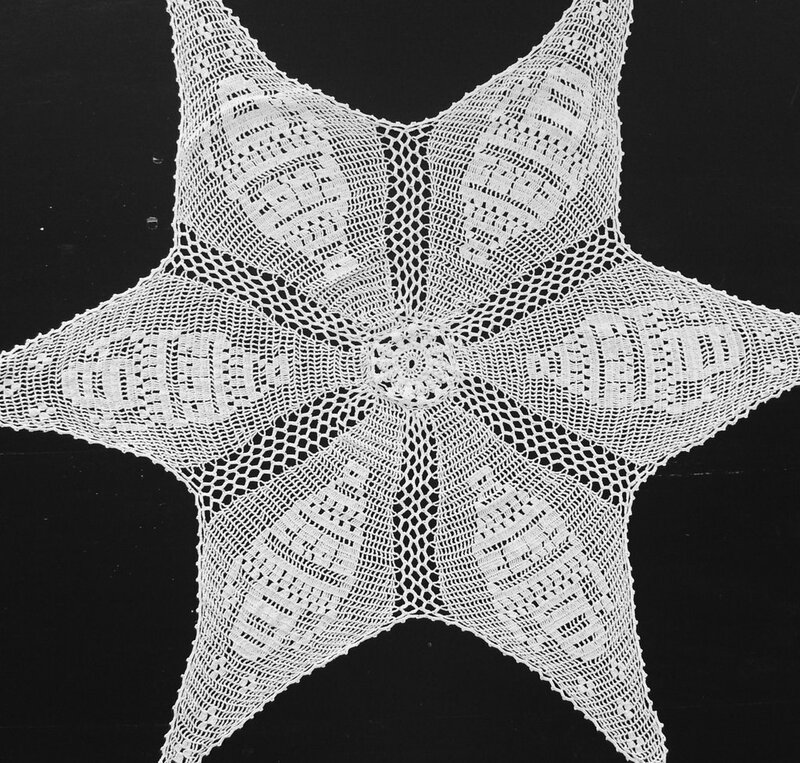 This post made me feel a bit nostalgic for the arts and crafts of my childhood with my Nana and with my Gramy. Both women were so creative and prolific...I just seem to spend a lot of time talking about doing things and never actually sitting down to do them! So great that these beautiful items are a part of your life and that you know some of the story behind them too. Huh? 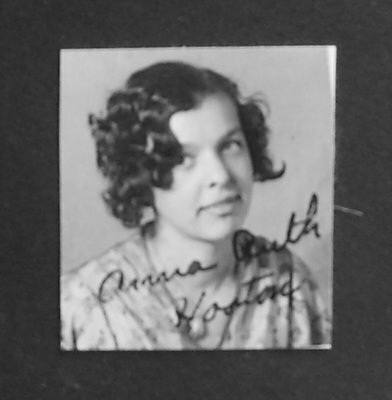 I stumbled apon your blog, and saw this picture with 'Anna Ruth' on it..
Really special to me, because my first name is Anna Ruth, and in the Netherlands, where I come from, its not a common name.